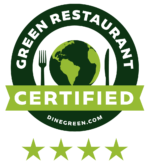 Rendezvous was the first UCLA restaurant to obtain a certification from the Green Restaurant Association. In 2012, Rendezvous received a three-star rating with 184.83 points. Bruin Plate received a three-star rating in 2015 with 231.62 points, then received a four-star rating in 2017 with 309.08 points. Read more from the UCLA Newsroom! Bruin Café received a three-star rating in 2018 with 201.48 points. Learn more by searching under ‘Los Angeles’ at the GRA’s website! • meeting the UC Sustainable Practices Policy through purchasing, energy reduction, waste reduction, green cleaning, and sustainable food purchases.